Just over a week ago I was eyeing the very sad calendar page pinned to my fridge. The calendar is both sad and small, easy to ignore and unremarkable. Then my son missed his orthodontist appointment because sad, small calendar is not only unremarkable but also hard to read with it's small print. Something needed to be done. It had to be dramatic and noticeable, it had to be easy. 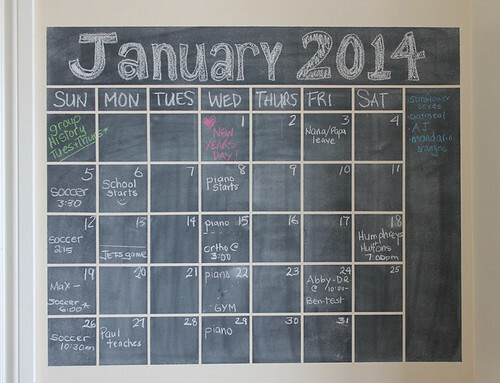 And so came the chalkboard calendar idea. I googled the concept and found lots of inspiration. This particular one caught my eye, it's less permanent which can be a good thing if you don't want to mark up your walls. However I'm a mix-it & paint girl so I went the route of paint. Chalkpaint to be exact. I used Rustoleums black chalkpaint - available at Home Depot. 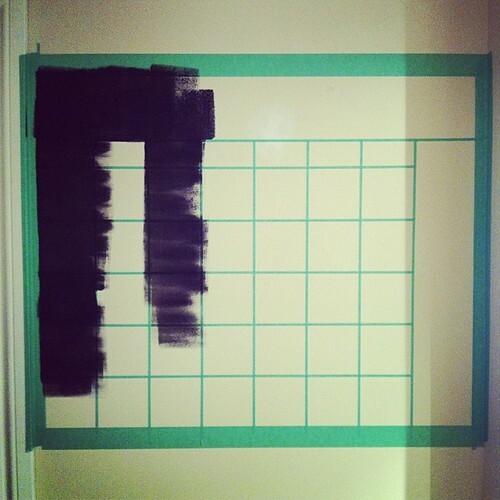 Next I marked my spaces with 1/4 inch tape to delineate the squares of a chalkboard and wider tape to set a boundary. From here it was pretty fast and easy. 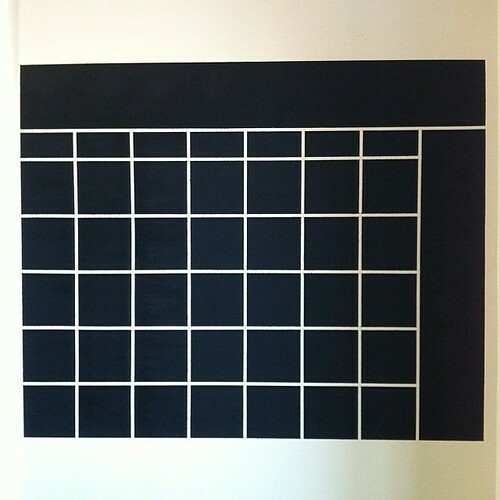 I painted a coat of the black chalkboard paint, waited for it to dry and then re-coated (4 hours later). The next day when I checked my wall it looked a bit rough and uneven. I sanded the chalkpaint down to make the walls a bit smoother, wiped the whole surface down lightly and painted a 3rd and final coat. If it wasn't for the sanding I would say that the whole process was completely painless. Make sure to let the chalkboard cure for 3 days with no writing, etc. 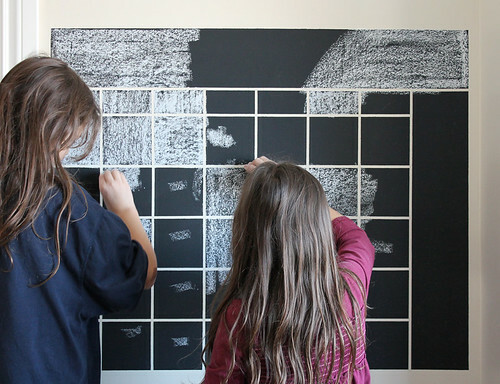 Once it is cured you have to condition the chalkboard by using a piece of chalk on it's side to cover the black. It helps to have minions do this part for you. Finally use a chalkboard brush to dry clean the board and you are good to go. After 7 days you can wipe the board down with a cloth. But as you can tell that won't be happening until the last day of January when I get ready to fill in the next month. Give it a whirl, and if your aren't brave enough to paint your wall then remember you could always buy the wall decals linked earlier. 2014 - hello world, I'm back... I think.